Why not cover their new single now? Posting a new track online for free is pretty standard these days, with Radiohead, Coldplay, Keane and many other huge bands all at it. 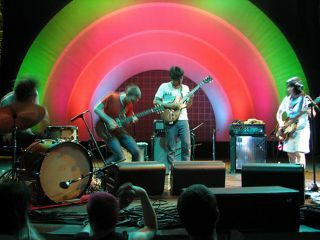 Trust American art-rockers Deerhoof to come up with a different slant. The San Francisco quartet have made their new single, Fresh Born, available for free download - not as an MP3, but as sheet music. The band expains: "For any band attempting to put out recorded music, the topic inevitably is broached: 'What are you going to do about leaking?' Your songs are going to leak too early and no one's going to buy it. So we came up with this way of leaking it on purpose. We'll leak the song - the platonic, abstract, ideal version, in sheet music form - in the hope that someone will look at it and maybe record their own version." The band promise that their own version of Fresh Born will be available soon, but in the meantime nearly 30 versions by Deerhoof fans are available at Deerhoof's dedicated website.